Flora Barndt Baum, the wife of Walter E. Baum, studied with Trego briefly in 1903 when her husband began his studies. She also began posing for Trego. Though she discontinued her art lessons in favor of caring for her daughter, Marian, Flora continued to pose for Trego. Here, she and Marian pose as the Virgin Mary and baby Jesus, respectively. Walter Baum remembered that Trego sang lullabies to his daughter while painting her. This may be a study for one of the several paintings Trego did of the nativity scene in 1905. 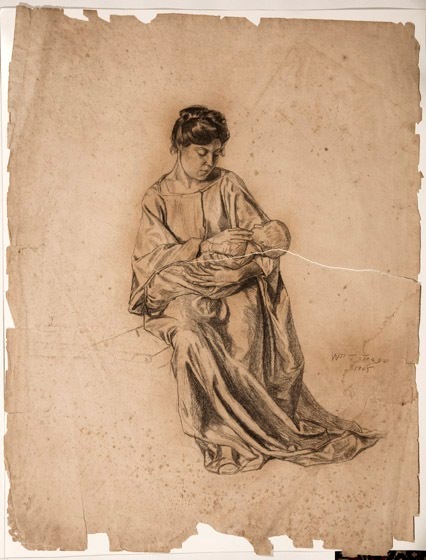 The sketch is one of several rescued by Walter E. Baum from Trego’s studio after his death. It passed to Baum’s son, Robert “Bert” Baum, and from him to the current owner. The paper is discolored and brittle. It has been torn nearly in half and there are some losses along the edges.